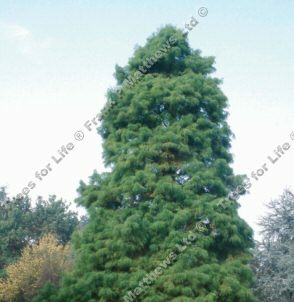 The Swamp Cypress Tree (Taxodium Disticum) is a broadly conical large tree with reddish-brown thin bark which is a grey/red brown colour with a string like texture and considered very ornamental. Not the sort of ornamental you would put a piece on the Mantle piece but more of a pleasing "Oh that looks nice" as you walk by or a "oh th......" if you are running. The naming of the Swamp Cypress tree is shrouded in mystery, mostly because we only had 10 minutes before lunch to find out and low blood sugar levels were a significant problem. A classic tree for waterside planting but will also grow in dry conditions. A non-evergreen tree which is very unusual for a conifer. Spring time leaf colour will be a light green which turns to a bronze to yellow colour in the Autumn. If you have planted this tree thinking it was evergreen, we suggest super glue and green spray paint as the easiest solution. It can be a little slow coming to life in the Spring time for most parts of the UK. At the time of writing the Swamp Cypress Tree had the RHS Award Of Garden Merit but the RHS have been known to remove these awards when a younger and better looking specimen comes along. If your site is very wet, the roots can appear out of the ground creating "knees". Checking these for arthritis will not help you age the tree. The root system is strong enough to withstand very high winds. A large height tree, so expect a height of over 6 metres (20 foot), after 10 years and will likely reach 20m tall and 15m wide at maturity. largest recorded specimens are over 40m tall but they might have been standing on tippy toe.The Swamp Cypress Tree does require a good summer to reach the taller heights. Considered a long lived tree with one specimen reaching 1620 years old. The small green cones turn brown when ripe. Generally, do not prune as they prefer to be left alone although removing dead, diseased or crossing over branches is always a good idea. It will tolerate most soil conditions, is fully UK hardy and you can plant in full sun or partial shade. It has a H7 frost rating which sounds like something your freezer would have but it actually means you can holiday with it in the most severe of European winters down to minus 20 degrees centigrade. Just don't take it in the hot tub with you. Give it more water than most other trees for at least the first 2 years after planting or plant it close to a natural water source e.g. pond, not a water mains running through your garden. The timber is odourless so we assume is ideal for making spy equipment or clothes for tracking wildlife with heightened senses of smell. We STRONGLY suggest sanding underwear with a fine grit to reduce splinters. With the UK market for wooden hunting clothes being woefully under supplied, this could be a great business. With a strong resistance to water and therefore rotting, it makes for a very useful outdoor timber and/or wooden incontinence pants. This tree is supplied at a height of 120 - 200cm in a 5-12 litre container for year round planting and better results than from either bare-root or root-balled stock. If you say Swamp Cypress Tree 50 times really fast, then your social life sounds pretty limited. If you are reading this whilst on a first date, the chances are it is not going well. The easiest way to plant the Swamp Cypress tree is to blackmail someone else to do it. If you have doubts about buying this tree because of it's size, you can just view it from further away.